There’s a lot of misunderstandings about what the lake of fire actually represents. When some people think of “hell” they think of the “lake of fire” and then they mentally picture people being burned physically in excruciating pain for all eternity. But the bible says “hell” gets thrown into the lake of fire (Rev. 20:14), so we know that hell is not the lake of fire. If you prefer to listen, I discuss this article in the video at the end of this post. The “lake of fire” idea is not a new idea that Jesus (Yehoshua) brought to the Israelites. He was a Jew and worshiped the same God as they did, the same God who thought it was an abomination to torture children for a finite amount of time in fire. YHWH said it never even entered His mind to do such a thing (Jeremiah 19:5). Since the Israelites never believed in eternal physical torture, it’s safe to say Jesus (Yehoshua) didn’t either. In order to understand the lake of fire we need to look at the rest of scriptures to see where these ideas came from originally. Where do we find the “lake” in the book of Revelation? Revelation 4:6 And before the throne, a sea of glass like unto crystal: and in the midst of the throne, and round about the throne, were four beasts full of eyes before and behind. The word “sea” is the Greek word thalassa which means, “the sea,” or “lake.” So there is a crystalline lake in front of the throne. The same word in Greek (krustallos) is used for the word crystal in both Revelation 4:6 and 22:1. So in the book of Revelation we’re given the picture of a throne with crystalline water (the water of life, not death) flowing as a river from the throne into the lake or sea in front of the throne. We know that the temple (and everything in it) was supposed to be patterned after what is in heaven. These objects are symbolic. They’re metaphors. This is where we get the saying, “As above, so below,” As it is in heaven, so we have figures or patterns of the heavenly on earth. These items represent something more spiritual. 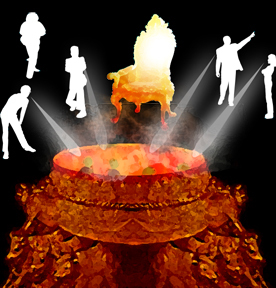 In order to know what the lake (or sea) in front of the throne is, we have to look at the Molten Sea that resides in front of the temple. The “lake” or “sea” is for washing in the “water of life”. It’s for being cleansed of the dirt, and becoming white as snow, so to speak. Isaiah 1:18 Come now, and let us reason together, saith YHWH: though your sins be as scarlet, they shall be as white as snow; though they be red like crimson, they shall be as wool. The LDS church actually has baptismal fonts based on the design from 1 Kings 7. This is a quote from Bruce R. McConkie taken from the webpage Molten Sea Explained. 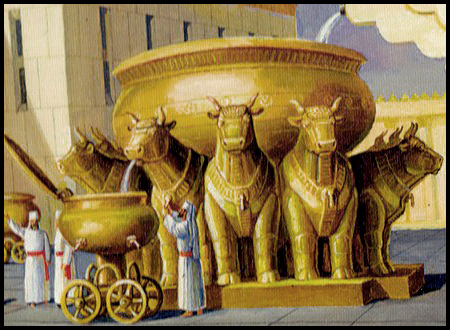 “In Solomon’s Temple a large molten sea of brass was placed on the backs of 12 brazen oxen, these oxen being symbolical of the 12 tribes of Israel. This brazen sea was used for performing baptisms for the living. There were no baptisms for the dead until after the resurrection of Christ. Mikvahs (aka baptisms) were not just a “Christian” practice that came later. The Israelites had been performing these ritual cleanses before John came baptizing with his message of repentance. A baptism without true repentance is useless, as you’ll just get dirty (sinful) again. Only if you are truly repentant can you keep yourself clean from iniquity. The following video gives a graphical interpretation of Solomon’s temple. There are screenshots from the video on their website. Exodus 38:8 And he made the laver/basin of brass, and the foot of it of brass of the lookingglasses of the women assembling,(which assembled at the door of the tabernacle of the congregation). There are a few commentaries on the use of “lookingglasses” that discuss the belief that the mirrors used were not actually glass mirrors, but bronze mirrors. Obviously you can melt down the bronze and fashion the basin this way. Either way, when you got into these baths you would be able to see yourself as the material that was used to make mirrors is what was used to make the baths and the sea would have been continually cleansed as it was considered holy. From JewishEncyclopedia: “The layer contained water sufficient for 150 ritual baths (‘miḳwaot’), if forty seahs be taken as the legal measure of such bath. The laver was not entirely round, as might be inferred from Scripture (I Kings vii. 23): the upper two-fifths were round; but the lower three were square (‘Er. 14a, b). You may believe that or not, but the point here is they do believe the water in the Molten Sea represented “the world.” In the bible, the phrases “the world” and “the waters” refer to people. The waters of life are flowing from the throne into the sea. The priests were washed in the waters of life in a form of baptism, so that they could be white as snow and “die not” when they approached YHWH in His throne. We are supposed to be “kings and priests” and thus we must be washed clean from our sin in order to approach YHWH’s throne. When you get washed, it’s in the same “water” that represents the “world” or “nations,” who are often referred to as wicked. Both “good” and “evil” are in this sea. Contrary to popular belief, we are not washed in blood. We are washed in the water of life and tried in the fire of affliction. All throughout the scriptures there are references to YHWH trying or testing people like metal in a refiner’s fire. Deuteronomy 13:1 If there arise among you a prophet, or a dreamer of dreams, and giveth thee a sign or a wonder, 2 and the sign or the wonder come to pass, whereof he spake unto thee, saying, ‘Let us go after other gods, which thou hast not known, and let us serve them;’ 3 thou shalt not hearken unto the words of that prophet, or that dreamer of dreams: for YHWH your God is testing you, to know whether ye love YHWH your God with all your heart and with all your soul. 4 Ye shall walk after YHWH your God, and fear Him, and keep His commandments, and obey His voice, and ye shall serve Him, and cleave unto Him. As discussed above, to know the spiritual implications, we should look at the shadows. In this case we look at the example of testing gold in the fire, and see how this relates to the spiritual purification. When someone wants to purchase gold, they want to know how pure the gold is; they want to know if there are any imperfections. One reason you wouldn’t want fake gold jewelry is because it can sometimes leave your skin discolored. 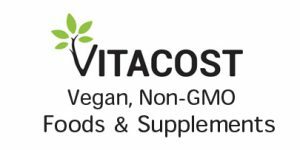 You would want to know if it is completely gold or is it just gold-plated with silver or copper underneath if you were worried about impurities affecting your skin. This is why jewelry makers advertise the purity levels. How Does This Relate to the Spiritual Aspect? YHWH is testing to see if we love Him completely (100% pure) or if we have any imperfections (sin). Are we like the people who look pure on the outside but on the inside are full of dead bones? This is an example of a gold-plated person. Matthew 23:26 Blind Pharisee! First clean the inside of the cup and dish, so that the outside may become clean as well. 27 Woe to you, scribes and Pharisees, you hypocrites! You are like whitewashed tombs, which look beautiful on the outside, but on the inside are full of dead men’s bones and every impurity. 28In the same way, you appear to be righteous on the outside, but on the inside you are full of hypocrisy and wickedness. YHWH wants to advertise His pure gold followers to the world, so He works on purifying all of us. Some take more time than others. It’s beneficial for us to consider whether or not we would consider ourselves very pure, because we want to be giving Him a good name/reputation in the refining business. 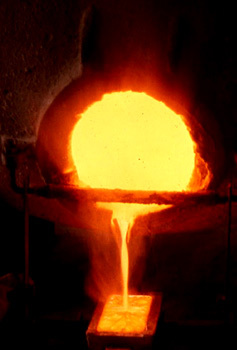 In order to purify gold, you put it into a crucible in order to heat it up. 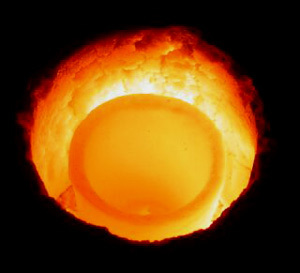 A crucible is a container that can withstand extremely hot temperatures. 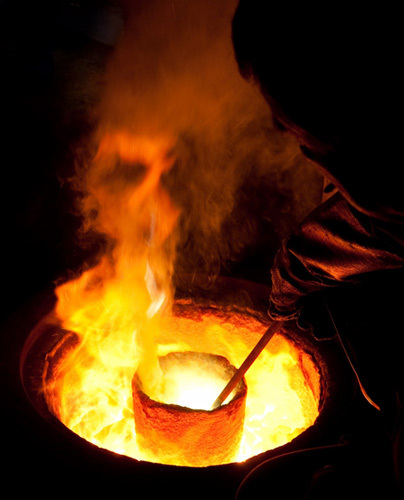 To test gold, you have to increase it to 1,100 degrees Celsius (2,012 degrees Fahrenheit). Then the dross (the impurities) separate from the gold and rise to the top. Every so often someone will scoop out the dross off the top and stir the gold again. You can continue to do this until there is no more dross coming up to the top. As stated above, YHWH is testing to see if our hearts are pure or if there’s any lawlessness/iniquity in us. Proverbs 17:3 The refining pot is for silver and the furnace for gold, But YHWH tests hearts. If there is iniquity found, He takes that away as refiners remove dross from metals. Proverbs 25:4 Take away the dross from the silver, And there comes out a vessel for the smith; 5 Take away the wicked before the king, And his throne will be established in righteousness. Here we see the wicked is the dross. Some may interpret that as wicked people being taken away, but you can also interpret that as the wicked sin is taken away from the people who are being purified in the fire and this last interpretation goes along with the rest of the verses here. The word for furnace that is used below is a word used for a smelting pot or a melting pot. Not surprisingly that’s where metals get melted. The word kur is not a word used for an incinerator (which would destroy what goes in). This distinction is important because of the teaching that the “lake of fire” will destroy everything (annihilationism) depends on the idea that what goes in doesn’t come out. The whole purpose of the “furnace of affliction” is to NOT cut people off, but to refine them back to their pure state of being without any sin/iniquity left in them. Isaiah 48:9 “For the sake of My name I delay My wrath, And for My praise I restrain it for you, In order not to cut you off. 10 Behold, I have refined you, but not as silver; I have tested you in the furnace of affliction. Psalm 66:8 O bless our God, ye people, and make the voice of his praise to be heard: 9 Which holdeth our soul in life, and suffereth not our feet to be moved. 10 For thou, O God, hast proved us: thou hast tried us, as silver is tried. 11 Thou broughtest us into the net; Thou laidst affliction upon our loins. 12 Thou hast caused men to ride over our heads; we went through fire and through water: but thou broughtest us out into a wealthy place. The mention of fire and water together is not a one-time thing in scripture. Fire and water are both used to purify. In Leviticus 13 fabric with mold was either burned or washed in water. John the baptist mentioned two forms of baptism, one of water, and one of fire. Matthew 3:7 But when he saw many of the Pharisees and Sadducees come to his baptism, he said unto them, O generation of vipers, who hath warned you to flee from the wrath to come? 8 Bring forth therefore fruits meet for repentance: 9 And think not to say within yourselves, ‘We have Abraham to our father:’ for I say unto you, that God is able of these stones to raise up children unto Abraham. 10 And now also the axe is laid unto the root of the trees: therefore every tree which bringeth not forth good fruit is hewn down, and cast into the fire. 11 I indeed baptize you with water unto repentance: but he that cometh after me is mightier than I, whose shoes I am not worthy to bear: he shall baptize you with the Holy Spirit, and with fire: 12 Whose winnowing shovel is in his hand, and he will throughly purge his floor, and gather his wheat into the barn/granary but he will burn up the chaff with unquenchable fire. The wheat (without chaff) represents the person who gets puts into the barn and the chaff that gets burned up represents the sin/dross that comes off through the furnace of affliction. John 15:1 I am the true vine, and my Father is the gardener. 2 Every branch in me that beareth not fruit He taketh away: and every branch that beareth fruit, He prunes it, that it may bring forth more fruit. 3 Now ye are clean through the word which I have spoken unto you. 4 Abide in me, and I in you. As the branch cannot bear fruit of itself, except it abide in the vine; no more can ye, except ye abide in me. 5 I am the vine, ye are the branches: He that abideth in me, and I in him, the same bringeth forth much fruit: for without me ye can do nothing. 6 If a man abide not in me, he is cast forth as a branch, and is withered; and men gather them, and cast them into the fire, and they are burned. Once again we see that those who have iniquity are “cast” into the fire. IF we abide in “the word,” that is torah / instructions, then we are the branches of the tree of life, where the tree of life is the body of Christ that God tends as the gardener. When you don’t abide in the torah you are thus committing iniquity and get put into the fire to have that iniquity purged out of you. This is very important to note for the Christians who think that they got saved just because they had faith and that there’s nothing else they have to do. When you truly repent of your sins you are washed clean, but as soon as you go back to sinning, you’re thrown back into the fire of affliction and have to face consequences for that sin. YHWH’s law to the demons was that they must flee when we resist (resist the devil and he will flee – James 4:7), but if we give in, we give the demons the right to afflict us to convict us of our sin, so we will once again repent. YHWH is the judge of whether or not we’re truly repentant (He judges our hearts – Proverbs 17:3) and the judgement comes quickly. We don’t have to wait until after we die for the judgement; the judgement is immediate. This is evidenced by those who go through deliverances and have the demons leave as soon as they repent and command them out. Even James wrote that the devil will flee when we resist, so this is not something we long for; it’s something that can happen right now. But for those who do not truly repent, they get tempted after their supposed repentance and end up doing the same thing all over again. So we need to abide in “the word” (the Torah/instructions that Christ gave) so His spirit can abide in us, and our house/temple/body will not be empty and the demons can’t come back. And here are a few more incidences of water and fire being used together. Numbers 31:21 And Eleazar the priest said unto the men of war which went to the battle, This is the ordinance of the law which YHWH commanded Moses; 22 Only the gold, and the silver, the brass, the iron, the tin, and the lead, 23 Every thing that may abide the fire, ye shall make it go through the fire, and it shall be clean: nevertheless it shall be purified with the water of separation: and all that abideth not the fire ye shall make go through the water. 24 And ye shall wash your clothes on the seventh day, and ye shall be clean, and afterward ye shall come into the camp. Isaiah 43:1 But now, thus says YHWH, your Creator, O Jacob, And He who formed you, O Israel, “Do not fear, for I have redeemed you; I have called you by name; you are Mine! 2 When you pass through the waters, I will be with you; And through the rivers, they will not overflow you. When you walk through the fire, you will not be scorched, nor will the flame burn you, 3 for I am YHWH your God, The Holy One of Israel, your Savior; I have given Egypt as your ransom, Cush and Seba in your place. The reason we won’t be scorched is because we are the metal, not the dross and that particular passage is referring to those who follow YHWH’s commands. There are some people who have a lot of iniquity (other metals inside), which means their purity levels are not as high and it may take a while to get that iniquity burned out of them. And they will likely feel burned by the fire of affliction if they’re lawless. Also remember that the “lake of fire” is a “lake.” The name itself represents a combination of water and fire. Ezekiel 22:17 And the word of YHWH came unto me, saying, 18 Son of man, the house of Israel is to me become dross: all they are brass, and tin, and iron, and lead, in the midst of the furnace; they are even the dross of silver. 19 Therefore thus saith the Lord YHWH; Because ye are all become dross, behold, therefore I will gather you into the midst of Jerusalem. 20 As they gather silver, and brass, and iron, and lead, and tin, into the midst of the furnace, to blow the fire upon it, to melt it; so will I gather you in mine anger and in my fury, and I will leave you there, and melt you. 21 Yea, I will gather you, and blow upon you in the fire of my wrath, and ye shall be melted in the midst thereof. 22 As silver is melted in the midst of the furnace, so shall ye be melted in the midst thereof; and ye shall know that I, YHWH, have poured out my fury upon you. The sinners will be melted in order to be purified. Melted metal is not “ash.” Melted metal can come out and be reshaped into whatever form the creator wants. Remember we are all but clay in His hands. If we are not working out right, we can be broken down and redesigned into masterpieces again. Isaiah 64:8 But now, YHWH, thou art our father; we are the clay, and thou our potter; and we all are the work of thy hand. Job 23:9 When He acts on the left, I cannot behold Him; He turns on the right, I cannot see Him. 10 But He knows the way I take. When He has tried me, I shall come forth as gold. 11 My foot has held fast to His path; I have kept His way and not turned aside. YHWH can put a gold-plated necklace into the fire of affliction, take out the dross, and reshape the necklace into a gold bar. In my case I was a lawless, luke-warm Christian who had enough afflictions in my life, that I called out to God and He saved me and took out the dross/sin, and transformed me into a new person. If He can do that for me, He can do that for anyone. Malachi 3:1 Behold, I will send my messenger, and he shall prepare the way before me. And YHWH, whom ye seek, shall suddenly come to His temple, even the messenger of the covenant, whom ye delight in: behold, he shall come, saith YHWH of hosts. 2 But who may abide the day of his coming? and who shall stand when he appeareth? for he is like a refiner’s fire, and like fullers’ soap: 3 And he shall sit as a refiner and purifier of silver: and he shall purify the sons of Levi, and purge them as gold and silver, that they may offer unto YHWH righteous offerings. 4 Then shall the offering of Judah and Jerusalem be pleasant unto YHWH, as in the days of old, and as in former years. 5 And I will come near to you to judgment; and I will be a swift witness against the sorcerers, and against the adulterers, and against false swearers, and against those that oppress the hireling in his wages, the widow, and the fatherless, and that turn aside the stranger from his right, and fear not me, saith YHWH of hosts. Malachi refers to YHWH’s messenger as the “messenger of the covenant” and “[YHWH’s] temple.” The body of Christ is the temple of YHWH. The messengers of the covenant (those who preach the true law/torah) are those messengers. They are the “tree of life” (the vine of Christ) sharing the fruit of the spirit and those fruits’ seeds with the world to spark something in them. Perhaps you could see them as the spotless bride of Christ, the repentant messengers who are still in the “world” but not of it. They are the “Body of Christ,” the virginal sacrifice dumped into the volcano (lake of fire) to save the “world”, so to speak. We need these “lights of the world” in the world to help purify the world. How else could the spiritually blind world come out of the dark, but for them seeing the light in us? So just as the purifier’s fire has both dross and pure metals, so too does the “lake of fire” have both righteous and unrighteous. But in the end of the age of the lake of fire, the dross will be taken out of us all. 1 Peter 1:6 In this you greatly rejoice, though now for a little while you may have had to suffer various trials, 7 so that the authenticity of your faith — more precious than a golden ornament, which perishes even though refined by fire — may result in praise, glory, and honor at the revelation of Jesus Christ. As you can see the bible is full of scripture concerning us being tried/tested by fire just as metals are put into a crucible to have the dross removed. Isaiah 6:1 In the year that king Uzziah died I saw also the Lord sitting upon a throne, high and lifted up, and his train filled the temple. 2 Above it stood the seraphims: each one had six wings; with twain he covered his face, and with twain he covered his feet, and with twain he did fly. 3 And one cried unto another, and said, Holy, holy, holy, is YHWH of hosts: the whole earth is full of His glory. 4 And the posts of the door moved at the voice of him that cried, and the house was filled with smoke. 5 Then said I, Woe is me! for I am undone; because I am a man of unclean lips, and I dwell in the midst of a people of unclean lips: for mine eyes have seen the King, YHWH of hosts. 6 Then flew one of the seraphims unto me, having a live coal in his hand, which he had taken with the tongs from off the altar: 7 And he laid it upon my mouth, and said, Lo, this hath touched thy lips; and thine iniquity is taken away, and thy sin purged. (1b) of HIS [GOD’S] NATURE, (2 Pet. 1:4), both of which proceed FROM HIMSELF. (2) In Acts 17:29 it is used as a noun with the definite article, to denote THE GODHEAD, THE DEITY, THE ONE TRUE GOD.” (Caps and underline emphasis are mine). WOW! What a marvelous revelation of Spiritual Truth! So, again, why is there brimstone in the lake of fire?” BECAUSE GOD ALMIGHTY HIMSELF IS IN THIS FIRE! God IS this fire, this spiritual “CONSUMING FIRE” (Heb. 12:29). THIS FIRE IS NOT ONLY SPIRITUAL; IT IS DIVINE! THE LAKE OF FIRE IS DIVINE SPIRITUAL FIRE FROM GOD OUT OF HEAVEN TO PURGE, PURIFY, CLEANSE, AND HEAL ALL IMPURITIES OF ALL HUMANITY!!! Is this not the best news you’ve heard all day? People are tested with brimstone (sulfur) in the “lake of fire” like metal in a crucible is tested for purity. Revelation 14:9 And a third angel followed them, calling in loud a voice, “If anyone worships the beast and its image, and receives its mark on his forehead or hand, 10 he too will drink the wine of God’s anger, poured undiluted (pure) into the cup of His wrath. And he will be tormented tested in fire and brimstone in the presence of the holy angels and of the Lamb. 11 And the smoke of their torment testing will rise forever and ever for the age of ages. Day and night there will be no rest for those who worship the beast and its image, or for anyone who receives the mark of its name. The mark of the beast is lawlessness, just as the mark of God is keeping the law (Exodus 13:9) so this fits with the idea of us being purified in the lake of fire. If you would repent, you’d able to be purified a lot quicker than those who continue to worship the beast (continue to practice lawlessness). Sadly, the translators seemed to put a spin on these passages to try to manipulate people into believing that there was a physical torture that people would have to experience for an infinite amount of time. As stated earlier the Israelites worshiped Ba’al and they sacrificed their children to him. They called it “passing them through the fire.” For every good thing – purification of people and removing sin/dross is a great thing – there is an opposite interpretation by those who are lawless. So even though YHWH says we need to go through fire (and we won’t be hurt by it), He’s referring to a spiritual fire, and the thought of physical fire or finite torture never entered His mind. Jeremiah 19:4 “Because they have forsaken Me and have made this an alien place and have burned sacrifices in it to other gods, that neither they nor their forefathers nor the kings of Judah had ever known, and because they have filled this place with the blood of the innocent 5 and have built the high places of Baal to burn their sons in the fire as burnt offerings to Baal, a thing which I never commanded or spoke of, nor did it ever enter My mind; 6 therefore, behold, days are coming,” declares YHWH, “when this place will no longer be called Topheth or the valley of Ben-hinnom, but rather the valley of Slaughter. The valley of Ben-hinnom is actually Gehenna, which is a word often used by Jesus (Yehoshua) and mistranslated into “hell” rather than the specific location that he was referring to. So, Gehenna (or “hell”) is the place where the Israelites started killing their children in fire to Ba’al and YHWH was displeased because the thought to do that never even entered His mind. People were taking something spiritual (being purified by the fiery Holy Spirit through conviction of sin) and turning it into a physical practice that was an abomination. But we still see people with this mindset today. Even though they say they love YHWH, their hearts are far from Him, and they have given Him a bad reputation by mistranslating these words to say that He would torture His own creation for an infinite amount of time. Atheists understand this faulty logic, and throw out the baby with the bathwater when they realize how illogical it is that the creator of all people would create people knowing full-well that He would have to destroy them or torture them for eternity, which isn’t even a just punishment for only a few years of the supposed crime of being created sinful by Him! It’s illogical, because it’s not true. In Revelation 14:11 the age of ages usually gets translated as “forever and ever.” You can see that it says aiōnas aiōnōn. It’s basically the same word, aión which means “age-long.” We can get that idea really easily if we read aion and eon together. Eon is just another word for an age and sounds very similar. Aeon is the same thing. They can mean really long periods of time, or just a life span. This may be a period of people reincarnating for a couple of lives, or it may just mean a few decades in someone’s life. We can’t be certain of that, but what we do know is that it’s impossible to add forever to forever, and if we take aiōnas aiōnōn to mean “forever and forever” it becomes nonsensical. Everyone knows you can’t add infinity to infinity. Not to mention there’s a day and night mentioned here, which won’t exist after these ages are over. There’s no need for the sun in millennium period because of the light of YHWH, which means there’s no more night, which means the time of this smoke being released has to end at some time before then. It cannot last forever. The word used in Revelation 14:10 basanisthēsetai is commonly translated as “tormented.” Why is that? The word’s first definition according to Thayer’s Greek Lexicon is to test (metals) by the touchstone. From the Wikipedia article Touchstone (assaying tool) “A touchstone is a small tablet of dark stone such as fieldstone, slate, or lydite, used for assaying precious metal alloys. It has a finely grained surface on which soft metals leave a visible trace. The touchstone was used in ancient Greece. It was also used by the Indus Valley Civilization about 3500 BC for testing the purity of soft metals. Drawing a line with gold on a touchstone will leave a visible trace. Once again we see that the lake of fire is symbolic of people being tested for their purity. Those who follow the commands of YHWH, keep the Torah, will pass through the lake of fire without being burned. But those who reject that, practice lawlessness, thus worship the beast, are being tested like metal in a refiner’s fire. They have to have the dross extracted from them, so they will continue to have their “mettle” stirred in the crucible so that the dross can be extracted. This would be extremely uncomfortable for those who don’t repent, as they would keep mixing with the dross (sin) and have to be shaken up again as the refiner continually tries to remove the dross once again. So if you read Revelation 14:10-11 again you will see the smoke of the testing goes up for the age of ages, until they repent and all the dross can be gotten rid of. Then we will have the new age (Messianic / Millennium age) where there will be no more sin because people will have all repented of that and the evil (sin/dross) will be ashes under our feet. YHWH is Spirit (John 4:23-24, Philippians 3:3) and invisible so when we see Him, we’re perceiving Him spiritually. He’s also described as being fire (Exodus 24:17, Deut 4:24, Deut 9:3, 2 Sam 22:9, Psalm 97:3) and water (Jeremiah 17:13), not literally, but spiritually. We know the Holy Spirit (that is God) prunes the branches that aren’t giving off good, spiritual fruit from the vine that is Christ. He does it by convicting us. Then we start to feel guilty and remorseful; it’s felt spiritually. The Holy Spirit was described as fire when the apostles received it at Pentecost/Shavuot. The Spirit is a spiritual fire that can’t be seen. It is also a spiritual water that can’t be seen. When John the baptist said someone was going to baptize people in fire, they didn’t take him literally thinking that when this person came, they would have to pass through a literal fire. They realized it was a spiritual fire, and in the same way, his baptizing people literally was just a shadow. of the spiritual baptism that had already occurred at their repentance. Jesus (Yehoshua) taught that we would have to be baptized in the same way he was (Matthew 20:22). He was baptized with water literally, but his mind was washed clean figuratively. He grew in wisdom, stature, and favor with God according to Luke 2:52. How do we grow in wisdom? By realizing we were wrong. It would make sense that he had made some mistakes, grew in wisdom, and got washed clean at his baptism and from then was without sin (because he knew better). First we are washed clean mentally, and then we get washed clean in the water baptism literally. If we were not washed clean mentally first, we would not even want to have a literal baptism. The mikvah, water baptism, is the sequel to the prime good of the purifying of the mind. (the prime good) YHWH purifies our mind in a spiritual water baptism. The physical baptism is a shadow or pattern of the spiritual one. Once we are spiritually and physically baptized by water, we should be spiritually baptized with fire. These are the trials and tribulations we have to go through to purify ourselves as God is pure. Jesus (Yehoshua) compared this baptism with “drinking the same cup he drank of.” See this video for more information on how we are to empty ourselves like he did. When Jesus (Yehoshua) was about to die he prayed for “this cup” to pass from him, but not his own will be done, but the Father’s will. We too have to drink that cup, which is this spiritual baptism of dying to our sin (our fleshy desires). We are not our sin (the dross), but often times we think we are. You can see my video Who’s Playing You? Are you doing our Father’s will or Satan’s? for more information on how we think we are when we’re not. It’s kind of like Stockholm syndrome. When we sin, our sin (demon) becomes our master, and we become a slave to it. Then we start to associate with it, as if that’s who we are. Then we try to make excuses for it (because we think it’s who we are). But it’s still keeping us enslaved, even when we sympathize with it. Jesus (Yehoshua) came to set us free from that slavery. Exodus 15:7 And in the greatness of Your excellence You overthrow those who rise up against You; You send forth Your burning anger, and it consumes them as chaff. 8 At the breath/spirit of Your nostrils the waters were piled up, The flowing waters stood up like a heap; The deeps were congealed in the heart of the sea. The exodus out of the slavery to Egypt mirrors our exodus out of slavery to sin. The Egyptians represented the demons that we are slaves to when we continue to sin. When you resist the devil he will flee, but if you don’t resist, you become a slave to your sin. Just as Joshua/Yehoshua took the Israelites into the promised land, so too does Jesus (Yehoshua) spiritually. But first you must exist the slavery to sin like Moses led the Israelites out of Egypt, through the water and fire. Exodus 15 7-8 lists it all, YHWH’s Spirit was burning as fire consuming the sin that was keeping the people slaves, and YHWH’ Spirit piled the water up to separate the wheat (Israelites) from the chaff (sin). When we are born again we pass through the spiritual water that renews our mind, and separates the true part of us from the sinful parts that used to be slave masters. Though many mainstream Christians try to say that they are forced to sin, this is found no where in scripture. Jesus (Yehoshua) actually says if you sin, you’re a slave to sin and he came to set the captives free. You can’t serve two masters, and if sin is your master, it means Jesus (Yehoshua) is not. Revelation 21:1 And I saw a new heaven and a new earth: for the first heaven and the first earth were passed away; and there was no more sea. 2 And I John saw the holy city, new Jerusalem, coming down from God out of heaven, prepared as a bride adorned for her husband. 3 And I heard a great voice out of heaven saying, Behold, the tabernacle of God is with men, and he will dwell with them, and they shall be his people, and God himself shall be with them, and be their God. 4 And God shall wipe away all tears from their eyes; and there shall be no more death, neither sorrow, nor crying, neither shall there be any more pain: for the former things are passed away. John is having a vision of the future when there will be no more death. At verse 5 he’s describing what He’s being told about the vision of the future 21:1-4). At that point, in the future, after death is done away with, there will be no more sea (lake). This is another reason the “lake of fire” is not torturing people for eternity, it doesn’t even last forever. Death is done away with. We are physically born and then we physically die. Once again this is a pattern to help understand the spiritual applications. For a Christian their experience may have been to be physically born (Birth #1), and then they lived in sin, and repented and died to that sinful way of living (Death #2). 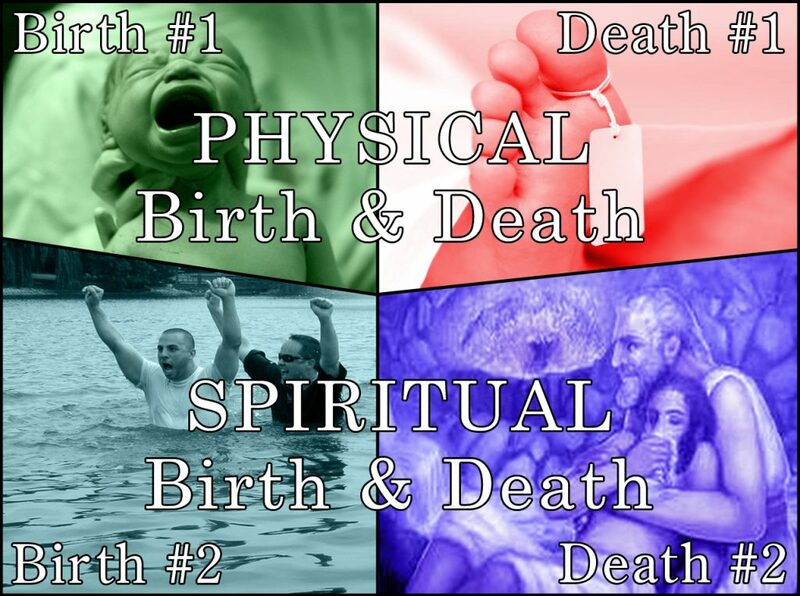 Then they were baptized and “born again of spirit” (Birth #2), and then they die physically (Death #1). For an unrepentant soul, they would be physically born (Birth #1), never died to their sins, never got born again, and then physically died (Death #1). They still need to die to their sins and be born again. The “lake of fire” is where they can die to their sins (let the dross come off in the second death) so they can be purified by the waters of life (Birth #2). Matthew 12:31 Wherefore I say unto you, All manner of sin and blasphemy shall be forgiven unto men: but the blasphemy against the Holy Spirit shall not be forgiven unto men. 32 And whosoever speaketh a word against the son of man, it shall be forgiven him: but whosoever speaketh against the Holy Spirit, it shall not be forgiven him, neither in this age, neither in the age to come. The Holy Spirit is what purifies us. If you blaspheme against the Holy Spirit (grieve it by not letting go of your sins), you’re going to be stuck in the “lake of fire” until you repent. It’s only the pure who come out. YHWH is getting rid of all the sin, and that’s why everything else can be forgiven in the ages to come (speaking of the ages of the lake of fire). But if you’re so stubborn that you won’t let yourself be purified and repent you’re going to be stuck there until you do. There are so many various Near Death Experiences (NDEs) that describe various places and religious figures but I think I can explain why that is in this theory. Our spirits may go back to God through this tunnel. Our spirits are probably very well aware of what’s going on and how everything works once we leave our bodies. So why is it people have such varied ideas of who they’re meeting? I know one person described meeting the demiurge who looked just like Jesus (Yehoshua) in Revelation. Others meet Jesus (Yehoshua) with the wounds in his hands, and others meet a great white light. The difference is those spirits all come back to their bodies, with different brains that try to analyze the information they remember. One brain thinks “Jesus” didn’t exist but believes in a demiurge, so he thinks that’s what he saw, others think Jesus (Yehoshua) is the creator YHWH, so they think that’s what they saw, others think the “source” is a white light so that’s what they saw once the experience was filtered their limited human minds with their personal memories and experiences. As discussed in the post Are We Spirits in Heaven Playing An Avatar On Earth? we may go back to heaven when we fall asleep at night, if we’re sleeping soundly that is. The bible says we are currently seated in heavenly places. We may just be spirits in heaven who are incarnating these bodies like avatars and then go back to heaven when the body is resting. Why Do Some People “Go to Hell” When They Die? Some people with Near Death Experiences experience a form of “hell” that scares them straight. Here’s where my theory starts to introduce the Seven Essene Mirrors. If our spirits are currently seated in heavenly places, and they go into the “Molten Sea” which represents the world, and the Molten Sea is reflective, then this world is a reflection of ourselves. The Seven Essene Mirrors actually says this, that everything we’re perceiving in this world is a reflection of ourselves. If we’re happy and kind, we’ll experience those things, but if we’re mean, and hateful, we’ll experience those things. Read more on the Seven Essene Mirrors for more on how that and the Law of Attraction works. Most people ignore these mirrors daily. The mirrors are usually seen as negative events to push through, but usually not taken as events to learn from. The mirrors are there for us to take a good look at ourselves and purify ourselves. But, since they’re ignored most of the time, the mirrors stay and continue to “test” the people in the fire of affliction. Whereas if you let the fiery Holy Spirit convict you of your sin when you are face-to-face with it, you can walk through fire of the “lake of fire” and not be burned. When we want to get to the Father on the throne, I think we have to pass through the “lake of fire” to stand before Him without any impurities in us. So, if you look at the picture, there’s a layer of “smoke” that we would have to pass through to reach heaven. I believe that it’s much easier to get rid of your sin while on earth, through washing yourself in the water of life (baptism of the spirit) than it is to get through this layer when we’re dead. This layer may be what was referred to as the “glass darkly” we see through while on earth. When we die, the spirit goes back to God, but it might have to pass through this layer, which is holding all the Essene Mirrors that reflect back to you your sin. So if you’re washed clean, then it’s very easy to pass through and you may do this nightly. When you pass through it at night, and come back to your body, what you saw on this journey is reflected back in your dreams. Our brains have a hard time taking in all this information which is why we get this stuff symbolically and it’s hard for our conscious mind to understand it. However, I think our subconscious understands what we saw. This traveling through the mirror layer at night may be why someone who is very sinful will dream about sin and have nightmares, whereas someone who is pure may have wonderful dreams and a bunch of symbolic messages from God. When you die, your spirit is kicked out of the body and then has to travel through these “mirrors” that reflect back to you your sin. You may be forced to feel every single thing you’ve done to harm others. If this is true, it might feel like “hell” to people who are sinful. To those who have been washed clean, and treat others with agape love as Jesus (Yehoshua) commanded, this will be very easy to pass through. Agape love is treating others as you would want to be treated, so when you see how it felt to interact with yourself through these mirrors, you’ll be pleased because you treated others the way you wanted to be treated. This is why the Golden Rule is so important and can lead to Universal Salvation. It’s a good thing that some people who have a NDE repent and start trying to clean up their lives, but the sad thing is when they start to preach that God tortures people for all eternity, giving Him a bad name. Isaiah 59:1. Behold, the Lord’s hand is not shortened, that it cannot save; neither His ear heavy, that it cannot hear: 2 But your iniquities have separated between you and your God, and your sins have hid His face from you, that He will not hear. If we want to easily traverse through the “lake of fire” and not be burned, we must stay in the vine that is Christ, and let the fiery Holy Spirit convict us of our sins. When we can look into the mirror and see the image of God, rather than the image of the beast, we will know that we are Holy (set-apart from the world) children of God. One of the objections to universal salvation is the idea that Jesus (Yehoshua) said only a few will find the way. That’s a very good objection. So how can we reconcile this? Matthew 7:13 Enter ye in at the strait gate: for wide is the gate, and broad is the way, that leadeth to destruction, and many there be which go in thereat: 14Because strait is the gate, and narrow is the way, which leadeth unto life, and few there be that find it. Luke 13:22 And he went through the cities and villages, teaching, and journeying toward Jerusalem. 23 Then said one unto him, Lord, are there few that be saved? And he said unto them, 24 Strive to enter in at the strait gate: for many, I say unto you, will seek to enter in, and shall not be able. 25 When once the master of the house is risen up, and hath shut to the door, and ye begin to stand without, and to knock at the door, saying, Lord, Lord, open unto us; and he shall answer and say unto you, I know you not whence ye are: 26 Then shall ye begin to say, We have eaten and drunk in thy presence, and thou hast taught in our streets. 27 But he shall say, I tell you, I know you not whence ye are; depart from me, all ye workers of iniquity. 28 There shall be weeping and gnashing of teeth, when ye shall see Abraham, and Isaac, and Jacob, and all the prophets, in the kingdom of God, and you yourselves thrust out. 29 And they shall come from the east, and from the west, and from the north, and from the south, and shall sit down in the kingdom of God. 30And, behold, there are last which shall be first, and there are first which shall be last. When is there weeping? Well there are no more tears in the millennium period, so this has to be during the lake of fire period before then. So, the time when only “few” find the way is during the “lake of fire” time frame, but once people allow the fire to purify them, when that process is finished, there will be no more tears, or weeping any longer. According to Luke 13 and Luke 16 (the parable of Lazarus and the Rich Man) people will be able to be sitting at “Abraham’s Bosom” (which is an idiom for the best seat next to the master of the house when dining) when they have gotten rid of their sin. The only way to get rid of your sin is to believe someone who has been risen from the dead. The rich man called Abraham his father. The Jews called Abraham their father. The Jews were always bragging about how Abraham was their father and how the Gentiles weren’t a part of this family. The rich man had 5 brothers. Judah was Abraham’s son in real life and also had five brothers. The rich man’s brothers had Moses and the prophets. Those who had descended from Judah’s 5 brothers all had Moses and the prophets but wouldn’t believe in the message from one who rose from the dead. “The name Lazarus is a transliteration of the… Hebrew name ‘Eleazar’ which means ‘God has helped’. Lazarus (Eleazar) must have had some kind of relationship with Abraham in real life because the parable places him in Abraham’s bosom where he now may find comfort after his death. He also must have been a ‘gentile’ (man not of the Jewish nation) since verse 20 and 21 use the phrase ‘longing to eat from the rich mans table’ which was typical of ‘gentile’ identification. In the eyes of the Jewish nation, Gentiles were considered dogs, or outcasts. The phrase ‘the dogs came and licked his sores’ shows us that they can only be consoled by non-Jews, since they were unworthy of YHVH’s blessings. And last but not least, he must have been a good steward because he was receiving blessings of finding comfort in Abraham’s bosom. Eliezer picks up a bride at a well, which reminds me of the story of Jesus (Yehoshua) at the well, offering the water of life from the Father to the Samaritan. There may be correlations there, but that has to be studied further. Some believe the Rich Man represents Israel in general. Others believe that it represents the High Priest with some very interesting reasoning behind that. I believe parables can have multiple meanings and another meaning is this: Lazarus represents those who have died and been “born again,” raised from the dead of their sin, and serve YHWH and walk righteously. Jesus (Yehoshua) raised us from the dead by his teachings, and our faith is our follow through, walking like he walked. We have died like Lazarus died, and we have been “born again” like Lazarus was. Those who follow Jesus (Yehoshua) and stop sinning, are mocked and hated by their own brothers and sisters, just as Lazarus was mocked and tormented while he was alive. But when the time of Jacob’s Trouble (Jacob’s Tribulation) starts, the true followers of Jesus (Yehoshua) will be in “Abraham’s Bosom.” Abraham and all the true followers will be with Yehoshua during the time of great tribulation, while those who didn’t have faith in Yehoshua (and thus did not walk as Yehoshua walked) will be cast into the fire of the tribulation. Luke 16:22 And it came to pass, that the beggar died, and was carried by the angels into Abraham’s bosom: the rich man also died, and was buried; 23 And in hell he lift up his eyes, being in torments, and seeth Abraham afar off, and Lazarus in his bosom. 24 And he cried and said, Father Abraham, have mercy on me, and send Lazarus, that he may dip the tip of his finger in water, and cool my tongue; for I am tormented in this flame. 25 But Abraham said, Son, remember that thou in thy lifetime receivedst thy good things, and likewise Lazarus evil things: but now he is comforted, and thou art tormented. 26 And beside all this, between us and you there is a great gulf fixed: so that they which would pass from hence to you cannot; neither can they pass to us, that would come from thence. 27 Then he said, I pray thee therefore, father, that thou wouldest send him to my father’s house: 28 For I have five brethren; that he may testify unto them, lest they also come into this place of torment. 29 Abraham saith unto him, They have Moses and the prophets; let them hear them. 30 And he said, Nay, father Abraham: but if one went unto them from the dead, they will repent. 31 And he said unto him, If they hear not Moses and the prophets, neither will they be persuaded, though one rose from the dead. The people who are stuck in the time of tribulation are those who would not believe one who rose from the dead. We, as true followers, have been risen from the dead, and we walk amongst those who are still dead in their sin and we try to warn them… but they don’t believe us. Thus, they don’t believe the testimony of “one went unto them from the dead” and they will not be “saved” from the tribulation coming. Only those who believe the testimony of those who have been raised from the dead, will be “saved,” because they will believe and follow YHWH’s commandments to be saved. When we love one another as ourselves, we fulfill the commandments. Also remember that the rich man asked for a drop of water. If that was literal, he wouldn’t be able to talk from screaming, and he would ask for a lot more than one drop of water. But we see the only way to not be burned by the fire is to be baptized with God’s water spiritually, then we can walk through the spiritual fire and not be burned for He is with us. Did Jesus/Yehoshua preach that all men will be saved? Based on Peter’s reaction, I would say, “Yes.” Rather than being happy to hear “with God all things are possible,” his response shows he had concerns. When some people hear the idea that everyone will be saved, they ask, “Even Hitler?” or “Then why on earth should we want to be saved and try to stop sinning?” According to Matthew 19, the apostle Peter’s response was the latter. It sounds like Peter is saying something like, “If all men are going to be saved eventually, what, then, are we getting out of leaving everything behind and following you?” Basically, “Why did we die to our old life to follow you if all the people who haven’t died to their old life are still going to be saved eventually anyway?” Then Jesus (Yehoshua) goes on to explain some benefits, so that does seem to be what Peter was asking. This goes back to the Prodigal Son story. The son who was always with the Father was upset that the Father was showing blessings to the lost son who returned. Oftentimes people get upset at the idea that a lost son, a major sinner, could be saved (think Hitler, pedophiles, vaccine-pushers etc). That is usually true of someone who got saved because they were afraid of “hell.” Those types of people think they have to be saved so as not to end up in hellfire one day, so they imagine the benefit of being “saved” is not being eternally tortured. When you take away that, they wonder WHY anyone would want to be saved (because they think it’s more fun and easy to live in sin). True salvation comes when someone wants to be saved from being a slave to sin. Anyone who can’t stop sinning is a slave to sin. The people who want to stop sinning are actually seeing a benefit IN THIS LIFETIME for why they would want to be saved, so they don’t tend to mind that others might be saved as they were. In fact, anyone truly walking in agape love will WANT all men to be saved. We should WANT people to stop sinning, right? I’d be thrilled if there was a massive repentance all over the world tonight. The world would be a much better place. And I do think with God ALL things are possible. And it’s God’s will that ALL MEN be saved. 1 Timothy 2:1 First of all, then, I urge that entreaties and prayers, petitions and thanksgivings, be made on behalf of ALL MEN, 2 for kings and all who are in authority, so that we may lead a tranquil and quiet life in all godliness and dignity. 3 This is good and acceptable in the sight of God our Savior, 4 who desires ALL MEN to be saved and to come to the knowledge of the truth. Do you think YHWH is going to get what He wants? So you’re also a universalist too. Universalism removes free will which you advocate for hence your contradict yourself and this is just a big game of god. None of that is biblical, but rather it comes from church fathers outside of the bible which you also heavily advocate for while criticizing Christian teachers of the 21st century, hence you’re once again criticizing yourself. I know you try to downplay and justify new age crap, but the reality is it’s just gnosticism repainted in the 21st century. Universalism does not remove free will at all. Just because you don’t understand how, doesn’t make it contradictory. The disciples thought Jesus was contradicting also, but he just spoke in ways that were hard to understand for most.